Before I get into the code and walk you through it, I wanted to talk about my motivation for this post. I recently spoke at the Confoo developer conference in Montreal. If you haven’t been, it’s a whirlwind of new technologies, complex data theories, useful soft skills, and solid, practical information for technologists of all sorts and levels. I’ve had the pleasure of attending (and speaking) the last two years and I always find an abundance of good information and good networking opportunities. This year was the first time that StrongLoop has had a presence, but given the contacts made with both users of LoopBack and new potential partners like Riak and Nexmo, I hope we are able to go back next year. What’s LoopBack? It’s an open source framework for quickly building APIs in Node and getting them connected to data. Based on the frequency of sessions surrounding it and conversations in the hallways, I can confidently tell you that the big story was APIs. From code frameworks to authentication to monitoring, everyone is moving in that direction. Indeed, the popularity of our own Al Tsang’s presentation at Node Summit has shown that momentum in the Node.js community and beyond. And Node is built well for just such a task. LoopBack already has authentication and authorization baked in. There is a base `User` class that you can use directly or extend to suit your needs. Each model in LoopBack can also have a rich set of access control rules built in using the existing user roles. I’m not going to talk in depth about these mechanisms, but you can read more at the link above. Instead, I want to focus on some insights from one of the sessions at Confoo: Chris Cornutt’s “Beginner’s Guide to Alternative Authorization”. You can review the slides from his talk on his SpeakerDeck page, but let me give you the TL;DR version: There are a lot of different authentication mechanisms, and all of them have their own nuances, benefits, and issues. This session was just an overview of a lot of those mechanisms, but it got me thinking about the authentication built into LoopBack and how a developer might make that more secure using something like a multi-factor process. 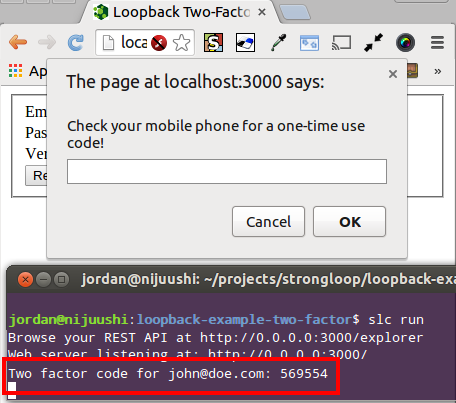 So, without further ado, let’s see how we can extend the existing LoopBack User login system to use two-factor authentication with a time-based, sms-delivered code. There are certainly many enhanced authentication mechanisms, as Chris’ presentation demonstrates, but we need to focus on something widely applicable to web applications and something we can build in one blog post! With the abundance of SMS APIs out there, sending a time-based code should be simple. Why time-based? Well, we want the user to only be able to use this code as they’re logging in, so we want it to be useless after an appropriate amount of time (maybe 60 seconds?). The user will enter their email and password, which will be verified. The system will send a unique code to their mobile device. The user must enter that code into the UI to complete the “log in” process. Ok, I’m sold… How do I implement it? Follow the prompts to create your application, then create a new model which extends the `User` class – I called mine “Employee”. Inside our new Employee model we’ll create two new remote methods for our 2(.5) step process. I’m going to skip straight to the methods themselves, but you can read about how to create them at the link in the last sentence. Here is our function for requesting a new two-factor, time-limited code. Note that it does 3 basic things: find the user, check their password, and send them a code. I’ve left out a bunch of error handling, but you can see it in the example repository. We’re also using the speakeasy library to generate our tokens, so we’ll require that first (be sure to install it as a dependency: `npm install –save speakeasy`). // Note that you’ll want to change the secret to something a lot more secure! // [TODO] hook into your favorite SMS API and send your user their code! Once the user has been sent their time-limited verification code they will need an endpoint to submit it to in order to complete the login process. Keep in mind that this code expires quickly (30 seconds is the default for speakeasy), so our UI should be ready to accept the code right away (no fumbling through multiple pages!). Again, in the example below I have left out a lot of audits for brevity in this blog post. Be sure to audit everything! // is used for all future API calls to authenticate the user. While it’s out of scope for this article, if SMS isn’t your thing and you’re already developing a native mobile application, you could also deliver the two-factor code using LoopBack’s push notification component! That’s it for the server! At this point you could execute `slc run` and go to http://localhost:3000/explorer and see your new model and the custom remote methods. However, they aren’t very interesting without seeing them in action. So let’s build out a lightweight front end to see how everything fits together. When the user submits the form we’ll check to see if they have a verification code yet, and if not, request one for them. Once they have a code we’ll send the second API call to complete the login process. // The access token will be in the data for use with future API calls! You can access the full example application code on Github, just clone the repository (or download the code), execute `npm install` from a console to install all dependencies, then execute `slc run` to start the application! Head to http://localhost:3000 to see the application in action! You’ll want to have the console up, since we don’t have SMS integration hooked up yet, the verification code will simply print to the server console. They can’t be all there is?! That’s really it! 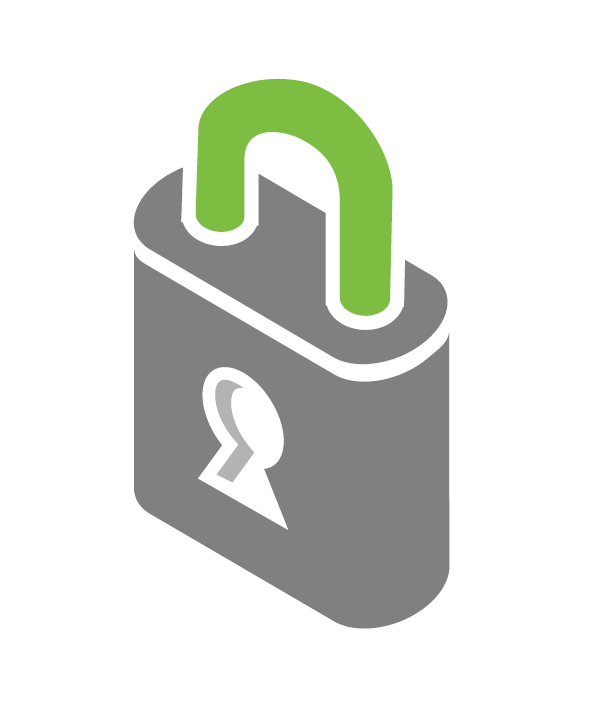 With just a couple of remote methods we can turn a fresh LoopBack application into a secure, two-factor authenticated system. Of course, it’s important to know what the right authentication mechanism is for your application and users. Additionally, you’ll want to add proper access controls to all of your API methods. Check out the tutorial on our documentation site for more information on setting that up! If this post only whet your appetite for more information on LoopBack, Access Control Layers, APIs, authentication, or even SMS via Node.js then hit me up on Twitter (@jakerella)! Or just post a comment, let’s keep the discussion of security going!